Regulations apropos of organic feed, which ensure utilization of purest methods of production, have led to lack of commercially available & permitted organic feed ingredients. Established stakeholders in the organic feed market are aiming to improve relationship between the requirements of the livestock sector and the organic feed market, while complying with organic farming regulations and address sustainability challenges. A recent study of Fact.MR envisages that organic feed market to record an impressive 7.6% volume CAGR between the period of forecast, 2018 and 2028. Supremacy of North America in the organic feed market is poised to prevail, in terms of revenues, with majority of the region’s market expected to remain consolidated in the U.S. Recent rise in dependency of the U.S. organic feed market, which has put operations at risk and cut down incentive of producers, has led the regional organic feed producers to spur domestic production for creating healthier soil and greater returns for farmers. Although North America reigns supreme in the organic feed market, growth in Europe is foreseen to be comparatively faster through 2028. Government support to farmers transitioning from conventional to organic feed production is a key growth determinant for the organic feed market in Europe. Huge ambitions shared by the EU appertaining to future agriculture strategy to prioritize environment protection as the primary agenda is another growth influencer for the organic feed market in Europe. Ruminants segment comprise a revenue share of more than 30% of the global organic feed market by livestock and are predicted to remain the key opportunity throughout the duration of the forecast period. With the increasing demand for organic feed products, there has been a persistent increase in the price of the feed. The high prices of organic feed is a barrier for consumers. To address this concern, global organic feed manufacturers are working towards reducing the existing price difference between organic and inorganic feed. Moreover, as demand for organic feed products increases, product innovations and economies of scale would result in reducing the cost of production, further driving consumption of organic feed products. The APEJ region is estimated to account for more than 16% market share in the global organic feed market in 2017 and this share is expected to grow by a massive rate of 550 BPS, causing the APEJ market to grab 22.5% market share by the end of 2028. This highly populous continent is spearheaded by the rapid economic growth in China, India, and Australia and New Zealand and customers in these countries will continue to demand the maximum organic food products such as meat and dairy. A volume of more than 10,976,311 tons and a value of over US$ 8,069.4 Bn in 2028 makes APEJ the behemoth in the global organic feed market. Among the distribution channels of the organic feed market business to business channel have relatively more share than the other sales channels which is likely to grow with moderate growth rate during the forecast period, however business to consumer channel shows lucrative growth rate during the forecast period in organic feed market by the end of 2028. Fact.MR has profiled some of the most prominent companies active in the global organic feed market such as Cargill Incorporated, Land O’Lakes Inc, SunOpta Inc, ForFarmers NV, Scratch and Peek Feeds, Feedex Companies LLC, Kreamer Feed, LLC, Aus Organic Feed, and Green Mountain Feeds. 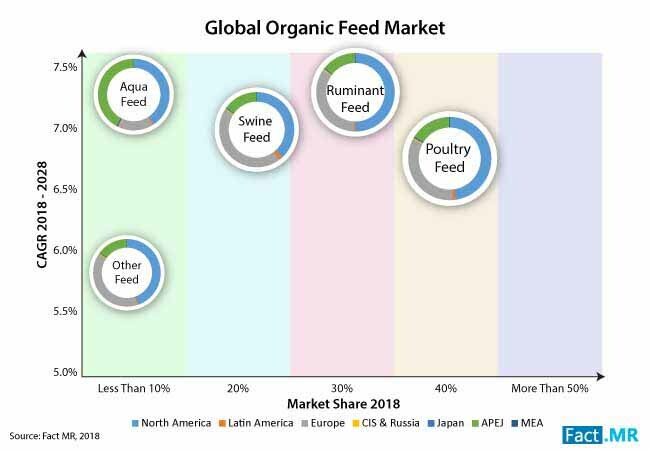 The key market players in organic feed market are focusing on backward integration for business development and expansion of their existing production capabilities. The organic feed market has grown consistently at a CAGR of 7.1% and the organic food market has been expanding at a greater pace. The Government is optimistic about organic feed products and are boosting the market competitiveness through various schemes. However, there is need to have an organic policy and organic cell to monitor organic feed and to take necessary steps to dampen the use of conventional feed.